The modern world is full of both challenges and solutions, yet how can we ensure that innovative minds are made aware of the problems they can solve? Where can those with a solution connect with those who need their ideas? The Social Challenges Innovation Platform answers those needs and provides a marketplace and meeting hub for those with a challenge, to conect with those with an innovative solution. The platform provides a place for exchange and an opportunity to build partnerships to feed the European Social Ecosystem with innovative solutions. The platform supports Public Authorities, Private Companies, and Third Sector Organisations, referred to as Challenge Owners, through the process of identifying social and environmental challenges, and deciding which ones should be uploaded to the platform. Once uploaded to the platform, the challenges can be viewed by Solution Providers which can be social innovators, startups, SMEs or other innovators. The providers then use the platform to accelerate their innovations and connect with those who need them most. Solution Providers can also apply for the open calls, and submit proposals to receive a grant of up to EUR 30.000 along with six months of mentoring to fully develop solutions to be used by Challenge Owners. The first open call and the awarded projects on the platform have already produced results. You can find out more about the platform, its work and the awarded projects on the main website. Companies that have women in leading positions consistently perform better than companies that don’t. However, innovative, techy and digital companies still excruciatingly lack women entrepreneurs. On 4 April, 33 innovative companies led by women and funded by the European Innovation Council (EIC) pilot met for an EIC Investor Day in Brussels to promote the access of women entrepreneurs to finance. In addition to panel discussions with investors and plenty of networking, 12 innovative companies got to pitch in front of investors. In addition, European Commissioner for Innovation Carlos Moedas announced the 13 finalists for the EU Prize for Women Innovators 2019, two of which are funded by the EIC. Only 30% of enterpreneurs in Europe are women. “No matter what way you look at it, it poses a problem. Socially, yes, of course, this is a recipe for an unequal society. But how about economically? We know that start-ups founded or co-founded by women generate higher revenues than those by men, and we are missing out”, commented Commissioner Moedas. One of the EU’s initiatives to encourage women to innovate and start their companies by promoting positive role-models is the EU Prize for Women Innovators 2019. The Commissioner announced the 13 finalists for the 2019 prize. Among the finalists are two women co-founders from the EIC backed companies: Nuria Espallargas, a co-founder of Seram Coatings, and Cécile Réal, co-founder and CTO of Endodiag. Ambassador Luminita Odobescu, Permanent Representative of Romania to the European Union and a mother of two, stressed the importance of educating young boys towards a goal of gender balance. “Political actors and business support organisations need to support women entrepreneurs in access to credit, cut red tape and mainstream gender perspective in all EU policies”. Gitte Pederson – a co-founder of Genomic Expression, emphasised the significance of networks among entrepreneurs: “It is important that women connect and help each other. You are trained so well in that first stage of the relationship, but since your investors are usually your partners, there is the whole other side to it which is all about getting to know each other”. The event hosted 17 investors from the private sector and investors from the European Investment Bank. The EIC Corporate Days link entrepreneurs with international companies to engage in open innovation towards new products, pilot projects and new business models. Since 2017, more than 400 companies funded under the SME Instrument, Fast Track to Innovation and FET Open have participated in matchmaking events with large corporates across Europe. Read the original article on the EASME website here. 18 companies backed by the European Innovation Council (EIC) pilot and working in the fields of electric mobility, connected transportation, and intelligent supply chains explored business opportunities with MAN Truck & Bus on 19 March in Munich, Germany. 85 companies applied to take part in a business acceleration event with MAN Truck & Bus in Munich, 18 of which were selected to present their ideas in front of 150 leading MAN employees and Group partners. The participants, hailing from 12 different countries, showcased ideas, prototypes, and products ranging from electric lorries to cargo bikes. Florian Stehbeck, Digital Innovation Manager and responsible for startup collaboration at MAN Truck & Bus, talked about the motivations behind the event: “We’re looking partners who are active in our core businesses. The production of hardware components, sales applications and engineering tools. But we’re also looking for “out of the box” approaches and new challenges.” Other MAN representatives also expressed the ambition to continue shaping the mobility and logistics industry by partnering with European entrepreneurs who share the vision of a more sustainable mobility future. Bestmile, Cambrian Intelligence, Fastree3D, Follow Inspiration, Insplorion, KG Protech, KINE, Linknovate, Maxitex, Mazaro, Millor Energy Solutions, Nerve Smart Systems, Nextsense, OneWatt, ONO, Pagita, Stratio Automotive and Valuechain. To learn more about the EIC Corporate Days, read the 2018 report, and to apply for future opportunities, have look at the event page. SMEs represent 99% of businesses in Europe and contribute to 60% of European private sector employment, creating 85% of new jobs. Enabling them to benefit even more from the Single Market is a priority for the European Commission. And in this light, it has been already 10 years since the European Union-funded program Erasmus For Young Entrepreneurs was launched as an initiative of the European Parliament. As a critical action of the Entrepreneurship 2020 Action Plan, the program aims to reignite entrepreneurial spirit in Europe, support new businesses in crucial phases of their lifecycle and help them to grow. In essence, Erasmus for Young Entrepreneurs is a cross-border programme facilitating the exchange of entrepreneurial and management experience. The exchange is implemented by a stay of a newly established or potential entrepreneur with a well-experienced entrepreneur running a small or medium-sized enterprise in another country. The two main actors are 1. The New Entrepreneurs (NE), understood both as nascent entrepreneurs, who are firmly planning to start their own business and entrepreneurs who have recently launched their own business with less than three years of operability and 2. The Host Entrepreneurs (HE) or successful and experienced entrepreneurs directly involved in entrepreneurship at SME level with more than 3 years of entrepreneurial experience. The exchange is facilitated by national Intermediary Organisations (IOs) that have been officially appointed to establish contacts between NEs and HEs and to ensure successful relationships between them. They exist to provide with the perfect match and help both parts with everything related to promotion, information, induction, validation or improvement of applications, arranging contacts, issuing contracts, logistical support, or simple advice and guidance through the process. Seems like a good deal, right? But if you still need a thought, get convinced by these five additional excellent reasons to boost your business with Erasmus for Young Entrepreneurs. Numbers speak for themselves! With more than 21,000 applications and 7000 established relationships set up, 61% of new entrepreneurs and 54% of host entrepreneurs have reported an increased turnover after participating in the programme. No magic wands, just hard work, and brilliant ideas! Ready? Read the full original article on Forbes. The new call for energy efficiency is now open! Around €112 million of EU funding is now available for energy efficiency research, innovation and market uptake. The deadline for applications is 3 September 2019. On 12 March the 2019 call for proposals for the Secure, Clean and Efficient Energy topics of the Horizon 2020 EU funding programme was launched. The funding is available for proposals submitted under 16 topics addressing 5 main areas: buildings, industry, finance, public authorities and policy support and consumer and services. The deadline for submission of proposals is 3 September 2019. The call is managed by the Executive Agency for Small and Medium-sized Enterprises of the European Commission. (EASME). All proposals for Horizon 2020 funding are submitted through the EU’s Funding and Tender Opportunities portal. The specific funding topics were presented at the Horizon 2020 Energy Efficiency Info Day on 22 January 2019, and video recordings as well as the presentation slides are available for viewing. The Info Day also featured presentations on the EU policy context and guidance from EASME on how to submit an excellent proposal. Horizon 2020 Energy Efficiency is also on Twitter. The European Enterprise Promotion Awards (EEPA) also recognise projects working towards sustainability, clean energy and environmental consciousness through the Supporting the development of green markets and resource efficiency category. Look through previous tetsimonials here on the News Portal and don’t hesitate to contact your EEPA National Coordinator for more information on this category and how to apply! On 28 February 2019, at an event in Ljubljana, Slovenia, the European Commission launched the 2019 edition of the European Social Innovation Competition. Under the theme Challenging Plastic Waste, this year’s edition is looking for ideas and projects that reduce plastic waste by targeting systemic change at the local, national and European level. Independent Judges will determine the three projects that will each be awarded €50,000 in October 2019. “We collect more than 27 million tons of plastic waste in Europe per year. Whilst addressing plastic waste is a big challenge, it is also an opportunity to innovate and create new solutions. That is why this year we are calling for ideas to tackle this societal issue, laying the foundations for new business models, new forms of cooperation and stimulating new ways of doing things for a better, cleaner and more sustainable future for all,” said Slawomir Tokarski, Director in charge of Innovation and Advanced Manufacturing at the European Commission. The European Commission has already implemented several measures, as part of a determined action to turn the challenge of plastic waste into a positive drive for the future of Europe. This includes the first-ever Europe-wide Plastics Strategy, the launch of the Circular Plastics Alliance as well as a voluntary pledges campaign. With these measures, the Commission is laying the grounds for a transition towards a more circular economy, fostering growth and innovation. Introducing new materials fit for a circular economy or that offer sustainable alternatives to fossil-based plastics. 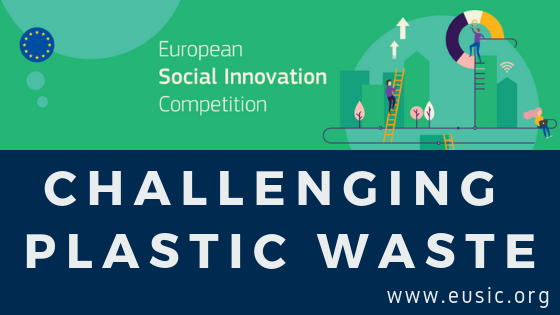 The European Social Innovation Competition is seeking ideas from social innovators, entrepreneurs, students, designers, businesses, doers, makers and change creators – anyone who has an innovative and creative idea for turning the tide on plastic waste. The 2019 edition of the Competition was launched in Ljubljana, a sustainability pioneer, former European Green Capital and winner of the 2018 Sustainability category in the European Capital of Smart Tourism Awards. This zero waste city collects 68% of its waste separately (more than any other European capital). Furthermore, two recent winners of the Competition are from Slovenia, demonstrating a burgeoning social innovation ecosystem in the country. Ljubljana was therefore a natural choice to host this year’s Launch Event for the 2019 Competition. At the Launch Event attendees had the opportunity to learn about the Competition and hear from one of last year’s winners, HeritageLab, regarding their experience. In addition, attendees were able to gain insights from a discussion panel in which some of this year’s Judges discussed the issue of plastic waste, as well as take part in a mini hackathon thinking up solutions to the plastics problem. The event closed with an exhibition titled “Toasted Furniture” from Slovenian artists Nuša Jelenec and Nina Mršnik. It showcased the artists’ innovative method of actually toasting plastic waste, transforming it into beautiful and colourful panels, which are then used as the building blocks for furniture and lighting. This offered a fantastic and creative example of Challenging Plastic Waste. Launched in memory of social innovation pioneer Diogo Vasconcelos, the European Social Innovation Competition is a challenge prize run by the European Commission across all EU Member States and Horizon 2020 associated countries. Now in its 7th year, the Competition acts as a beacon for social innovators in Europe, employing a proven methodology for supporting early-stage ideas and facilitating a network of radical innovators shaping society for the better. Each year the Competition addresses a different issue facing Europe. This year, the focus is: Challenging Plastic Waste. The EU Social Innovation Competition is back for a 2019 edition, and will kick off on 28 February 2019 in Ljubljana, Slovenia. The competition was set up by the European Commission in memory of social innovation pioneer Diogo Vasconcelos, who was chairman of the Social Innovation Exchange. The Social Innovation Exchange is a global community that encompasses several types of stakeholders including NGOs, global firms, academics and public agencies, working together to tackle modern societal challenges such as ageing, climate change and public sector services such as healthcare. Diogo also launched several initiatives, including the Entrepreneurs Academy, before his passing in July 2011. The launch event in Ljubljana will officially open the 2019 edition and bring together innovators, entrepreneurs and policy makers to discuss and share ideas on social innovation. The event will see the unveiling of the 2019 theme and mark the official entry start date. At the event, participants will have the chance to meet and listen to previous competition winners and innovation experts, as well as explore how Ljubljana became the first European zero waste capital. Participants will also take part in group activities related to the 2019 competition theme. To round up the event, there will be a ‘Toasted Furniture’ art exhibition focused on circular economy by Nuša Jelenec and Nina Mršnik. Register for the launch event here and don’t hesitate to express your interest in the 2019 competition and learn more here. Follow the latest event updates on Twitter via @EUSocialInnov and make sure to follow #diogochallenge. From 17-21 June 2019, the EU Sustainable Energy Week will be back for its 4th edition. The Week will take place in Brussels and is the biggest European event dedicated to efficient energy and renewables. The theme for 2019 is “Shaping Europe’s energy future” and will cover: the Policy Conference, Networking Village, EUSEW Awards, and the Energy Days. The awards and Policy Conference applications have now closed, but there is still time to sign up for the 2019 Networking Village and to register a local 2019 Energy Day event. The Networking Village will be a chance to meet and interact with stakeholders in sustainable energy innovation and will be hosted in the European Commission’s Charlemagne building and the Residence Palace from 18 to 20 June 2019. Find out more about the different elements of the Networking Village here and sign up to host a networking activity before 25 March 2019. The Energy Days take place throughout May and June and collect together events that promote and focus on clean energy transition. Energy Day events are a chance for both citizens and businesses to learn about clean energy and sustainability, and to discover how it can impact and be incorporated into their daily activities and practices. Register your event as soon as possible and find out more about the Energy Days right here. Get involved on social media with @euenergyweek and #EUSEW19, and become part of the EU Sustainable Energy Community for the latest updates. Find out more about EU Sustainable Energy Week 2019 on the EASME website. The European Innovation Council (EIC) pilot of the European Commission is hosting an exclusive pitching event for Women in Tech. The event will take place on 4 April 2019 in Brussels, and will be an opportunity to meet female entrepreneurs and top tier European investors, as well as discuss the challenges facing female entrepreneurs and how to address the financing gap. • Network with fellow EIC pilot funded SMEs and engage directly with top European investors. • Development of an innovative solution with a strong gender dimension. Deadline for applications: 20 February 2019. Apply here. For more information on the event and applications, read the original article on the EASME website.